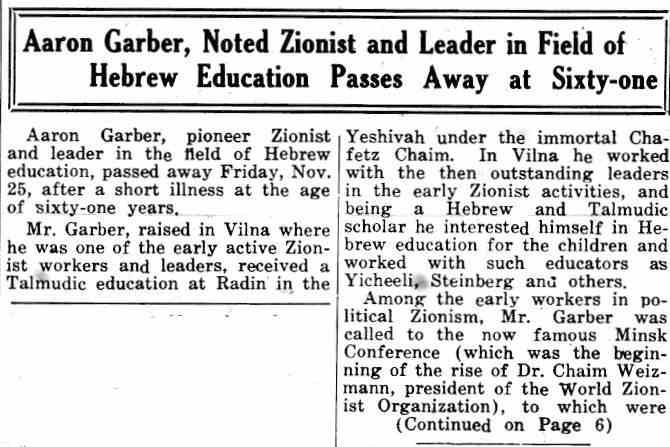 The most extensive obituary for Aaron Garber was published by the weekly Jewish Independent in its December 2, 1938 issue. We show it below, copied from a microfilm at the Western Reserve Historical Society. To read his obituary in the November 26. 1938 Plain Dealer click here. Aaron Garber's addresses show how small someone's Jewish world might be before the post World War II migration to "the Heights". He and his family lived at 1430 East 105th Street, near where the Veteran's Administration Hospital stands today. His memorial service, with 700 persons attending, was held a few days after his funeral at his synagogue The Cleveland Jewish Center (today Park Synagogue), at 1117 East 105th, about a half-mile north. The offices of the Bureau of Jewish Education were also at 1158 East 105th Street, just a few streets north of his home and then moved to an old mansion on East Boulevard and 105th Street, just a few streets south, on the site of the VA Hospital.